One Citrus County student was taken to a local hospital for observation Friday morning after a truck rammed into the back of a school bus. According to the Citrus County Sheriff’s Office, a truck crashed into the back of the bus on Cardinal Street at South Rudolph Point in Homosassa. Troopers believe the driver came up over a crest in a hill too fast and was distracted by looking at his radio while going downhill. 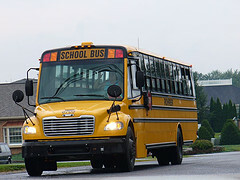 The bus was carrying 34 students heading to Lecanto Primary School. Officials do not believe there were any injuries, but the one student was taken by ambulance to Oak Hill Hospital to be looked at by a doctor. According to the Florida Highway Patrol, the truck driver was arrested for multiple driver’s license suspensions and cited for careless driving. Careless driving simply means that a driver is improperly driving, thus creating a dangerous scenario for those sharing the roadway and increasing the chances of a collision. While some of these actions are driving violations, many drivers fail to realize that they are putting others in danger when they speed, swerve in and out of their lane or do not remain at a safe distance behind another automobile. If you or someone you love was injured by a negligent or careless driver in Homosassa or the surrounding area, a Citrus County Auto Accident Lawyer at Whittel & Melton can provide you with the legal tools, strategies and understanding needed to establish liability. We remain intent on protecting the rights of injury victims throughout Citrus County and will exhaust every possible avenue when it comes to strengthening your claim. Call us today at or contact us online for a free case evaluation.